"Käthe Kollwitz and German Expressionism" featured over fifty works by Käthe Kollwitz plus additional works by Ernst Barlach, Rudolf Bauer, Max Beckmann, Heinrich Campendonck, Marc Chagall, Lovis Corinth, Otto Dix, Lyonel Feininger, Conrad Felixmuller, Hans Fronius, Georg Grosz, Erich Heckel, Hannah Hoch, Karl Hofer, Wassily Kandinsky, Ernst Ludwig Kirchner, Paul Klee, Oskar Kokoschka, Ludwig Meidner, Edvard Munch, Gabrielle Munter, Heinrich Nauen, Emile Nolde, Max Pechstein, Hilla von Rebay, Georges Rouault, Rudolf Schlichter, Karl Schmidt-Rottluff, Siegfried Schott, Georg Tappert, Wilhelm Wagner, and others. Barlach, a sculptor, printmaker, and writer, was one of leading figures of German Expressionism. A trip to Russia in 1906 had a lifelong impact on his work: the hunched-over peasants and beggars, the open landscapes of the Russian plains, and the great disparity between the deeply religious lower classes and the frivolity of the upper classes all helped him to develop a basic artistic vocabularly. His work, which presents an image of humanity totally at odds with the Nordic superheroes so beloved of Nazi propaganda art, was condemned by the Nazis as "Degenerate," yet before they came to power, his work was widely shown in Germany and he had been awarded many commissions for public sculptures. After Barlach resigned tp protest the firing of Kathe Kollwitz, he was hounded almost to death by the Nazis, who stripped him of all of his public posts and confiscated nearly 400 of his works from German museums and destroyed several large public sculptures. There is, consequently, little relationship between the stated size of editions and the actual availability of his prints. Barlach was also an important writer, author of seven plays, and in 1924 was aarded the Kelist Prize for literature. 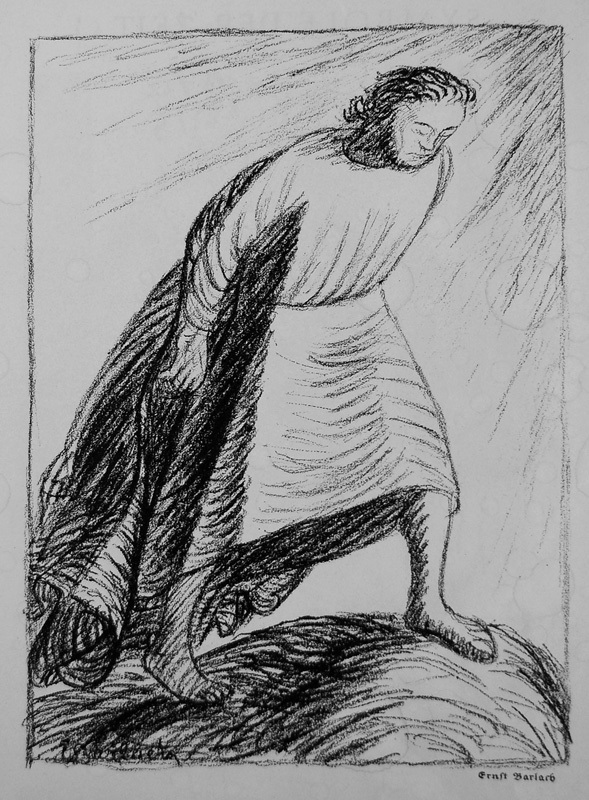 Selected Bibliography: Ernst Barlach, The Transformations of God. Seven woodcuts. With selections from his writings. trans. Naomi Jackson Groves (Hamburg: Christians, 1962); Ernst Barlach: 1870-1938 (London: Arts Council, 1961); Carl Dietrich Carls, Ernst Barlach (NY: Praeger, 1969); Bruce Davis, German Expressionist Prints and Drawings: The Robert Gore Rifkind Center for German Expressionist Studies. Volume 2: Catalogue of the Collection (Los Angeles: Los Angeles County Museum of Art/ Prestel, 1989); Franz Fuehmann, Ernst Barlach. Das Wirkliche und Wahrhaftige. Briefe, Grafik, Plastik, Dokumente. Fotos von Gisela Paetsch (Wiesbaden: R. Lowit, 197); Naomi Jackson Groves, Ernst Barlach: Leben im Werk (Konigstein in Taunus: K.R. Langewiesche, 1972); Carl Georg Heise, Ernst Barlach zwischen Erde und Himmel: 45 Handzeichnungen (Munich: Piper, 1960); Kent W. Hooper, Ernst Barlach's Literary and Visual Art: The Issue of Multiple Talent. Studies in the Fine Arts: Art Theory, No. 15 (Ann Arbor, MI: UMI Research Press, 1987); Elmar Jansen, Ernst Barlach: Werke und Entwürfe aus fünf Jahrzehnten. Ausstellung im Alten Museum. 3 vols. (Berlin. Akademie der Künste der DDR, 1981); Kurt Reutti and Günter Busch, Ernst Barlach: Das druckgraphische Werk ed. 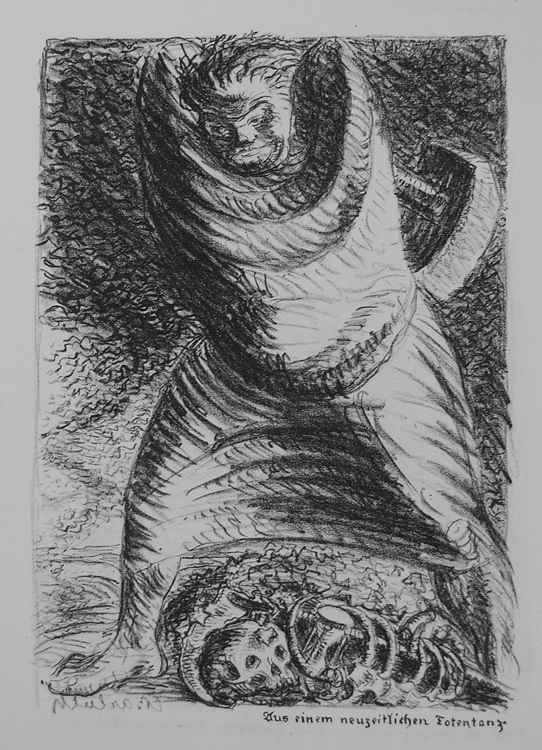 Dore und Kurt Reutti-Stiftung (Bremen, Kunsthalle, 1968); Friedrich Schult, Ernst Barlach: Das Plastische Werk (Hamburg: Ernst Hauswedell, 1960); Friedrich Schult, Ernst Barlach Das Graphische Werk. Werkverzeichnis Band II. (Hamburg: Ernst Hauswedell & Co., 1958); Friedrich Schult, Ernst Barlach. Werkkatalog der Zeichnungen (Hamburg: Dr. Ernst Hauswedell & Co, 1971); Wolf Stubbe and Armgard Hardt, Ernst Barlach: A loan exhibition (Washington, DC: Smithsonian Institution, Traveling Exhibition Service, 1962). 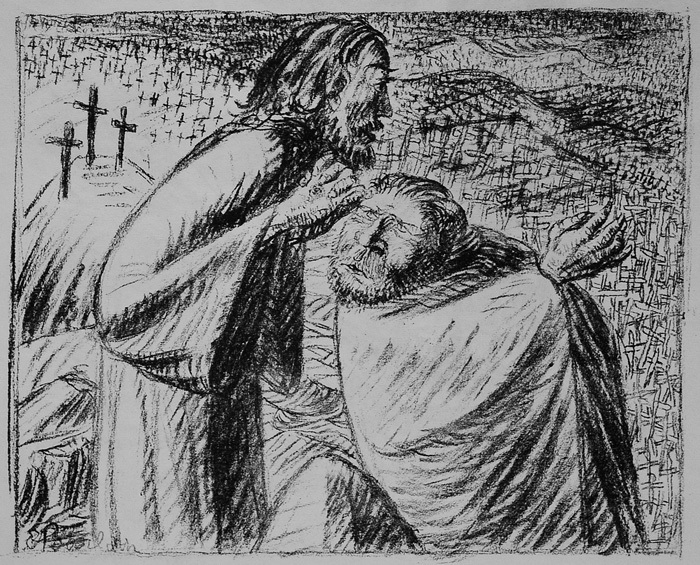 Anno Domini MCMXVI Post Christum Natum (Schult 80, Davis-Rifkind 83), 1916. Published in Der Bilderman (1916), an German art periodical that commissioned and published original lithographs by a number of Expressionist artists including Heckel, Kirchner, Slevogt, Grossman, and Kokoschka. Signed in the stone. Image size: 182x235mm. Price: $1250. Demut / Humility (Schult 72, Davis-Rifkind 86), 1916. Published in Der Bilderman (1916). Signed in the stone. Image size: 295x218mm. Price: $1200. From a new Dance of Death (Schult 78, Davis-Rifkind 84), 1916. Published in Der Bilderman (1916). Signed in the stone. Image size: 299x210mm. Price: $1250. 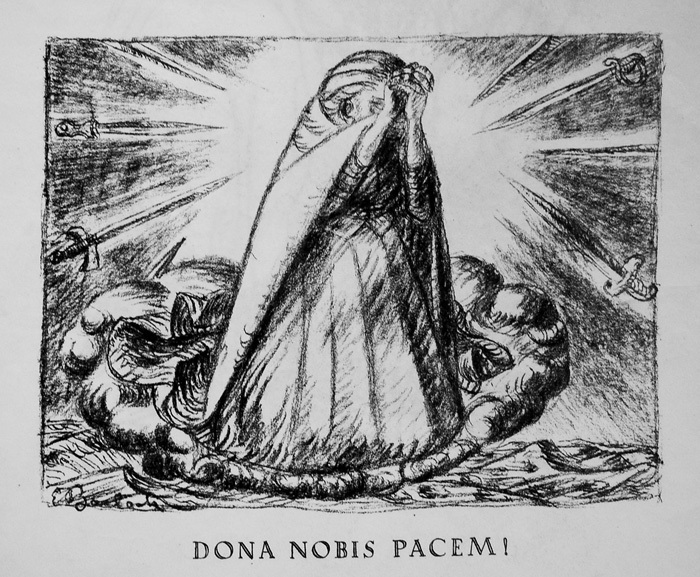 Dona Nobis Pacem / Give us peace (Schult 82, Davis-Rifkind 87), 1916. Published in Der Bilderman (1916). Signed in the stone. Image size: 178x232mm. Price: $1750.